The oil palm plantations also lead to the disappearance of so-called peat domes. These are thick layers of organic material that once exposed to air and oil palm related fertilizer decompose quickly. As a result they produce vast amounts of greenhouse gases while losing up to 20 cm of peat every year. That then again leads to more severe and more frequent flooding. This is also damaging river systems and the services they provide to local people. The pictures Dudung sent show what that really means in practical terms and how it impacts our work for the orangutans and people in Tembak and increases our operational expenditures. Dudung taking a selfie while going through a flooded part of the road to Tembak. Under this river of mud is a track with deep gullies, making it very hazardous for our staff to go through. Only motorbikes can make it through hear with great difficulty and high risk. On the left the last oil palm plantations. This is where the road quality immediately changes! 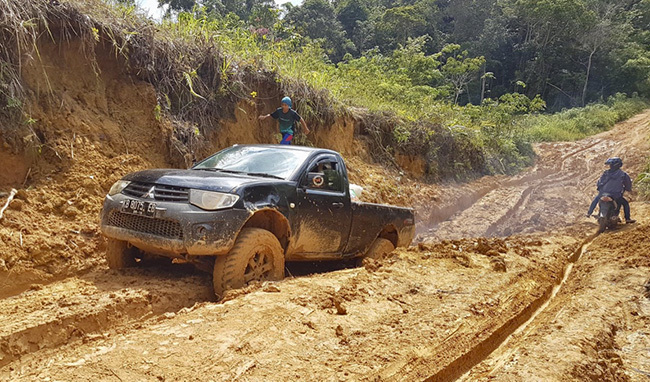 From here our convoy to bring supplies for both the orangutans and the local people can no longer use our VSA sponsored terrain vehicle. Only when we reach the now isolated Tembak region some local cars can help us again. Once we get close to Tembak we finally receive some help from the local car that can only operate in the isolated village.